White tea comes from the delicate buds and young leaves of the Camellia sinensis plant. It's harvested earlier than other teas. The best tea buds are harvested in March and April. It's critical to harvest white tea on a frost free morning of a dry day, after a night's dew has dried. It's critical that buds remain undamaged in harvest. Young tea leaves, with fine silvery-white hairs on unopened buds, produce the finest quality tea. 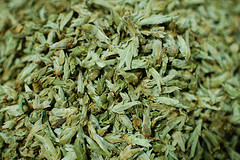 White tea is mostly grown and harvested in the Fujian province of China. Leaves and buds wither in natural sunlight before being processed. Young tea leaves and unopened buds are steamed or fired to inactivate polyphenol oxidase. Next, the leaves and buds are dried. Silver fuzz remain on the unopened buds, then turns white when dry, thus the name "white tea". White tea is a pale yellow liquid drink with zero calories! In the past it was considered a rare and expensive tea. History tells us only Chinese emperors and courtiers would drink this tea. It was the preferred tea of Chinese royalty. Today, it's widely available around the world! BRIGHTEN COMPLEXION: Brew 1 cup of white tea. Next, add 2 tbsp. honey. Add 2 tbsp. aloe. Add 1 tsp. lemon juice. Next, slice 1 cucumber. Add cucumber slices to other ingredients. Mix all ingredients together, well. Refrigerate mixture overnight. In the morning, apply cucumber slices to face. Let stand for 3 to 5 minutes. (The cucumber slices absorbed the other ingredients.) Remove cucumber from face. Rinse face with water, thoroughly. Gently pat dry. White tea has powerful nutrients and antioxidants. Diminish the visible signs of aging: fine lines, wrinkles, dark spots. White tea soap has an exotic tea fragrance that never seems to get old. SOAP MAKING TIPS: Brew white tea strongly. Add 1 teaspoon, (or so), of ginger in tea. (CAUTION! DO NOT OVER USE GINGER). Ginger can irritate skin, causing burns or blisters. Ginger helps to add a little kick! White tea and ginger blend well together in homemade soap recipes! -- Palm Oil .......... 10 oz. -- Hemp Oil ......... 9 oz. -- Illipe Butter ....... 11 oz. -- Coconut Oil ....... 11 oz. -- Palm Kernel Oil .. 9 oz.